BBC Shop.com have announced that the Doctor Who 50th Anniversary Special, The Day of the Doctor, will be made available in the UK on both the DVD and Bluray formats on Dec 2. Pre-order the DVD HERE and the Bluray HERE. The latter of the formats features the 75 minute film in its 3D form, which will broadcast in select cinemas and will be the last show to broadcast in 3D on the BBC. A release date has not been set for a worldwide home video release, though it's likely to be the same week. 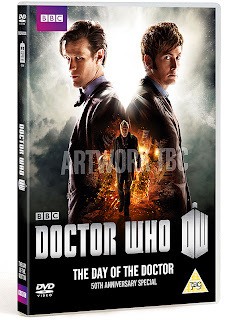 The Day of the Doctor airs on Nov 23 - visit the episode section HERE for pics, clips and news. 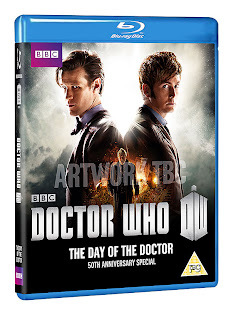 Pre-order the Doctor Who 50th Anniversary Special, The Day of the Doctor on DVD HERE and on Bluray HERE.